Busiek State Forest is a great place in the Ozarks where you can find some of the best trails in Branson. Many of the outdoor fun in Branson that can be enjoyed at Busiek State Forest include mountain biking, hiking, horseback riding, and outdoor shooting range. The forest covers an area of 18 miles of hiking trails with three skill levels ranging from easy to moderate. These hiking trails are marked in different colors depending on difficulty. The creek that runs through the area is the highlight of the trails. Along this beautiful creek, the trails run through several valleys, and some wooded hills. Overall, these hiking trails offer great outdoor fun in Branson. Busiek State Forest was named in honor of Dr. Urban and Erma Marie Busiek when the Missouri Department of Conservation purchased the first sections of the land from them. The forest has an area of 2,505 acres which are all accessible for hiking, camping, biking, horseback riding, and more. Although the park doesn’t have spectacular rock formations or waterfalls, it does offer campsites and panoramic hilltop views of the Ozarks. There are two hiking trail systems available at the forest, a 10-mile “East” trail system and an 8-mile “West” trail system. These two trail systems extend more than 18 miles through some of the most beautiful and rugged areas of the upper Ozarks. Each trail system features three color-coded loop trails that range from 2-4 mile each. The trails use as the old dirt roads that travel through the Camp Creek and Woods Folk valleys, and the satellite trails extend from there. 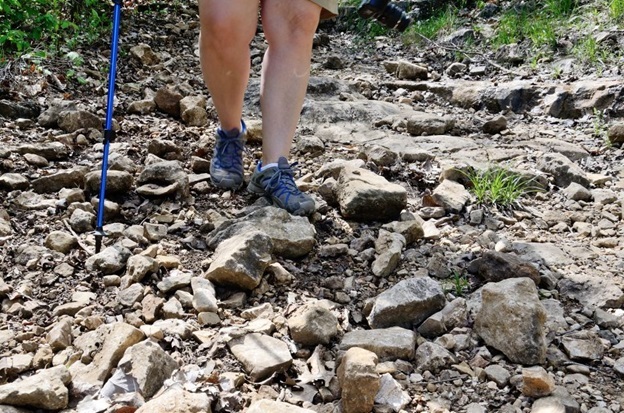 The trails at Busiek State Forest could be used for a weekend backpacking trip, though you need to double-back at certain times during your trip. The forest has about nine primitive, designated campsites, each relatively close to the eastern trailhead. The state forest is actually close to the Mark Twain National Forest, but they are separated by several tracks of private lands. If you want to enjoy a nice trip into nature, plan for a day hike along portions of the White and Purple trails in the West part of the forest, and the Red and Yellow trails in the East part of the preserve. The trails that you can find in the area are very well marked with spray paint on trees at eye-level, and are worn out from use. To enjoy the best of your nature trip, start with the White/Purple trails and follow Camp Creek, a wet-weather stream. After about a mile of hiking, the Purple Trail splits off from the White Trail. You may experience a challenging trek and start climbing upward and ascending more than 200 feet. Then the trail extends more than a mile and descends the mountain using a series of switchbacks, eventually ending back at the trailhead. So, if you are looking for the best trails that provide great outdoor fun and nature-friendly activities such as mountain biking, hiking, and horseback riding, visit the Busiek State Forest in Branson.